Our unique sound and approach is based on two very engaging female lead vocalists and a crew of very talented and experienced musicians. The band debuted at a Battle of the Bands Semi-Final at DaVinci's Pub in Collegeville, PA back in 2013 - and WON! Selected comments from the judges: extremely tight; excellent vocals; complement each other well, no ego competition. We have since followed up with an unbroken track record of compelling performances with very complimentary reviews from all of our clients, which accounts for our large number of repeat engagements, in addition to over 500 followers on Facebook. You can see some of our pre-gigmasters engagement history below. Take a stroll through the Photos section for s picture bio of our team. Our anchor members are our singers, Sandra Giraud and Tiffany Yeager. They hold down our sound and drive our feel, and develop and deliver our chemistry with the audience. 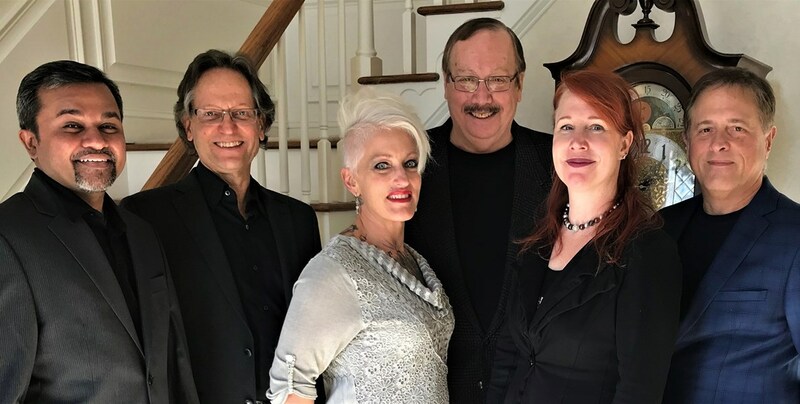 Our musician crew is composed of Charlie Breuninger (bass and vocals), Greg Viola (keys/guitar/sax/harp), Ray Glucksman (drums), and Ashi Parmar. They form the foundation of the sound that supports and drives our vocalists. Fantastic performers, creative, and professional. Very crowd pleasing, they go above and beyond every year for the Get Well Gabby foundation.! i hired Scarlett Sometime for an 80s theme party that we held at our summer home this past Saturday. They were able to learn a bunch of songs that we requested and ROCKED IT!!! Everyone had an incredible time and they added such a great energy to the party. I would highly recommend them to anyone looking for a fun, accommodating, band for their next party! I run activities for a 400+ site camping resort and we have an 80s weekend every year. Scarlett Sometime has rocked our 80s dance these past two years and I can't wait for them to come back to our resort again next year. I'm also bringing them back for at least one of our major holiday weekends. Not just an 80s band. I would recommend them with no hesitation. The instrumental and vocals were excellent. They even worked with a very difficult acoustical environment and worked with me on sound levels and it was perfect. 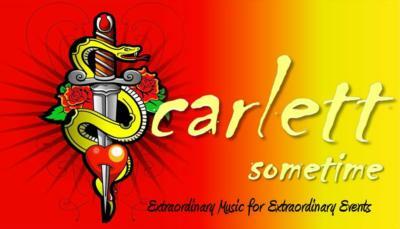 If you have an event that you need a band... BOOK SCARLETT SOMETIME! You will be very happy you did! This is the fourth time we've had Scarlett Sometime play here. 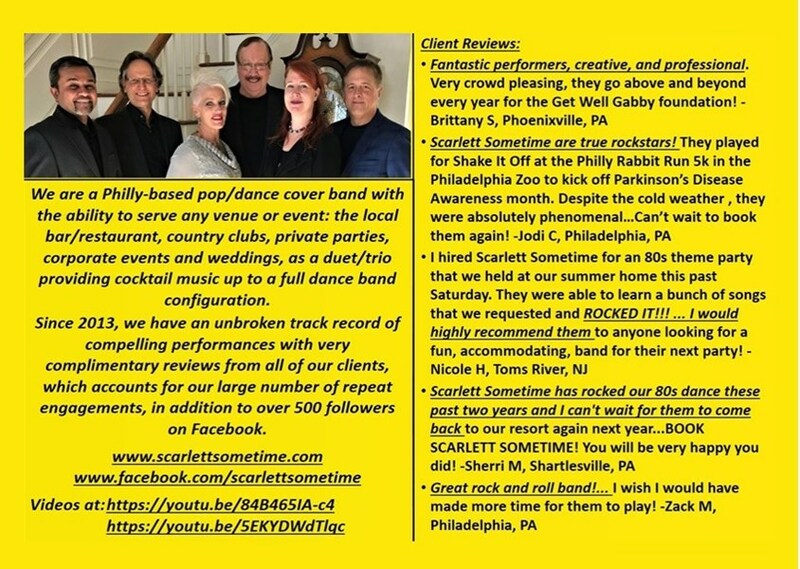 We had a big snow/ice storm that evening, and despite the awful travel conditions and slim prospects for a crowd (we pay solely on commission), Scarlett Sometime showed up right on time and provided a great performance for the entire night. Band is tight, vocals superb, and music selection very diverse and entertaining. Excellent and flexible to work with, real pros, none of that band 'attitude'. Looking forward to the next performance. Please note Scarlett Sometime will also travel to Villanova, Radnor, Southeastern, Bryn Mawr, Bridgeport, Conshohocken, Devon, Haverford, King Of Prussia, Ardmore, Berwyn, Broomall, Gladwyne, Valley Forge, Havertown, Narberth, Newtown Square, Norristown, Wynnewood, Audubon, Bala-cynwyd, Lafayette Hill, Merion Station, Paoli, Philadelphia, Plymouth Meeting, Drexel Hill, Oaks, Upper Darby, Blue Bell.